Call us at (315) 853-6225 today. For more information or to schedule an appointment with our Clinton chiropractor, call (315) 853-6225 today! 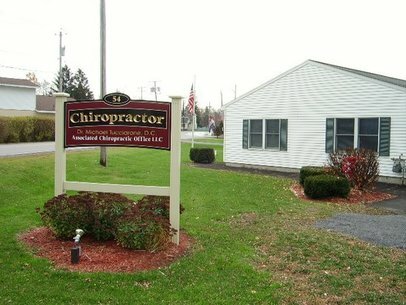 Dr. Michael Tucciarone is a chiropractor serving Clinton and the surrounding area. Our chiropractor and the rest of the welcoming team at Associated Chiropractic are committed to providing chiropractic solutions to address your unique needs, whether you are experiencing back pain, neck pain, headaches, or even muscular tightness and tension. You may be searching for pain relief after an accident, experiencing an injury, or if you suffer from a specific condition like chronic back pain or a spinal condition. Even if you are looking to improve your overall health, our chiropractor can help you attain your everyday wellness goals! Visit our testimonials page to find out what our patients are saying about our Clinton chiropractor and our chiropractic care plans. At your first visit to Associated Chiropractic, Dr. Michael Tucciarone will explain how chiropractic care works and give you a full evaluation to see if our chiropractic solutions are a good fit to address your needs. If there is a good fit, we can customize a plan of chiropractic care for your condition and health goals. If you have not been to a chiropractor before and want to find out more, please email us or call (315) 853-6225 to receive the answers to your questions from our experienced team. We also welcome referrals, so we invite you to share our chiropractic and wellness information with your friends and loved ones. "I have been to many Chiropractors over the years and he is second to none. Very knowledgeable to the point and fixes the problem. Not only that we brought my 4-year-old son to him because he has always had problems going to the bathroom. Through conversation, Dr. Tucciarone said he may be able to help. Since Dr. Tucciarone adjusted his back 3 years ago he has not had a single problem. Thank you for all you do"
"Dr. Tucciarone is not only my friend but the most compassionate and empathic chiropractor I've ever known and visited. He is a miracle worker and treats all his patients with utmost respect and genuine concern. The office is very accommodating and Mary is awesome. Truly the Best of the "Best"." "I highly endorse Dr. Tucciarone! At 61, I sustained several injuries from a fall on concrete. Eight months later, after seeing two orthopedic physicians and three physical and alternative therapists, Dr. Tucciarone has been the only medical professional to turn my condition around for me to begin to heal! With his cutting-edge technology, unique expertise, vast knowledge and compassionate care I am walking and free of pain and inflammation. I am a music professional and have been able to play the piano again. He is a saving grace and I am forever grateful!"